Wondering just what the point of polarized lenses is? Read this. On those glaringly bright sunny days, the advantage of wearing polarized glasses is plain to see. That's because polarized sunglasses reduce the intensity of glare from the sun. So, if you're intent on spending the bulk of your summer afternoons outdoors, polarized lenses might just be your prescription for easy outdoor viewing. While light from the sun's rays is bright, the light that our eyes perceive is typically scattered in different directions so by the time it reaches our eyes it is much more subdued. However, when light reflects onto flat surfaces—like a body of water, the surface of the road, or the hood of a car in oncoming traffic—it arrives at your eye in a more intense, sustained direction, causing glare that can feel momentarily blinding. Such glare is irritating at best, and at worse dangerous (especially if you're driving and suddenly can't see). Come summer, this brightness is amplified, making it hard to see when outdoors. Do polarized sunglasses make that much of a difference? 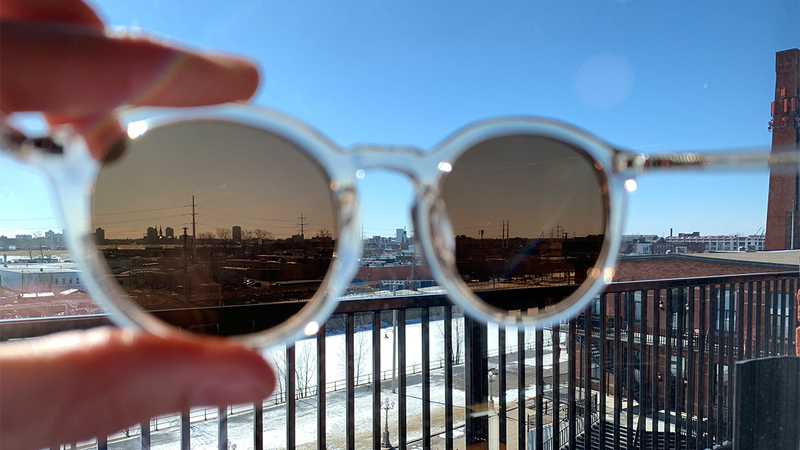 Polarized lenses maybe look like regular sunglasses, but in the case of polarized sunglasses from BonLook these come with a filter embedded into the lens which blocks out horizontal rays to eliminate glare. In a way, it’s kind of similar to how the blinds on a window work. Those who spend a lot of time outdoors—fishermen, skiers, hikers—do indeed see a difference compared to not wearing them. The benefits are numerous: polarized lenses reduce eye strain which happens when you squint just to make out objects clearly under the bright sun. As you surely know, straining your eyesight can cause things like irritation, fatigue, and potentially even headaches to occur. But mixing in polarized lenses, and your eyes will feel nothing but comfort when outside. Colours take on a more vivid, brighter appearance, too! And finally, with polarized lenses, you'll see just how magically clarity and contrast are improved. While people who work around water might find them ultra-beneficial, polarized lenses aren't recommended for looking at any type of screens on the long-term. This is something to keep in mind as many newer car models come with an LED screen on the dashboard, so going back and forth from the road to the interior screen may affect your vision. Now that you know the benefits of polarized sunglasses, it’s time you picked up your own pair. In fact, with our new Escape collection, every pair of non-prescription sunglasses are already-made with polarized lenses for only $149—the kind of pricing that’s never been seen before for polarized lenses. Pick up a pair in time for some sunshine.